Andrea and I are in the process of setting up some public events during Autumn 2012. Mental illness is a serious problem that is surprisingly common but usually misunderstood. The good news is that people can recover from depression, bipolar disorder, anxiety and schizophrenia. 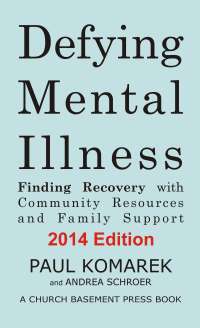 In this one-hour presentation, local authors Paul Komarek and Andrea Schroer will help take the mystery away from these illnesses and identify common sense recovery strategies that work for you, your children and your family members. If your group is interested in booking us, we're available, and can customize programs for your needs. Please contact us at paul.komarek@humanintervention.net.